Living healthy is a constant struggle. Between diet and fitness requirements, it’s tough for the average career person to meet their body’s basic needs. Especially in a place like the office, you may find yourself constantly struggling to stay on point. There’s so many temptations, from colleagues going out for lunch to company-supplied beverages and snacks. But eating healthily at the office can be done, it’s just a matter of determining what works best for you. 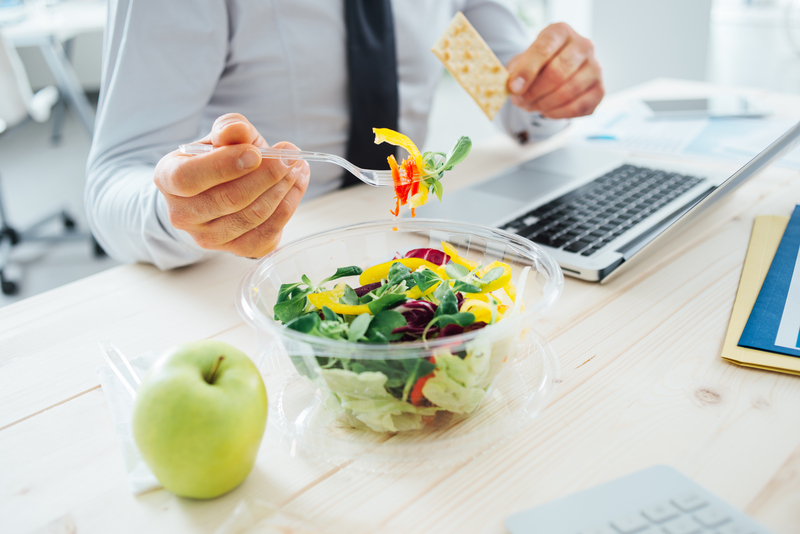 Below are three questions you should ask yourself to help you decide the perfect health-conscious meal for work. We also included some examples for inspiration. What portion size do you prefer? Some people prefer to eat 3 meals a day, others prefer to snack regularly throughout the day. Both are great options, provided that the foods are healthy. If you prefer larger meals, consider preparing your meal the night before. Suitable foods that also make up a hearty meal can be baked chicken with a side salad, or grilled salmon over steamed rice. And if you’re someone who likes to snack, there are plenty of alternate substitutes to your favorite junk food snacks. You can start eating oatmeal in lieu of breakfast cereal, or a granola bar in lieu of cookies. Are you in close proximity to anyone? In a typical corporate workplace, everyone is in close proximity to one another, but exactly how close are you to others? Are you in a closed office space where your colleagues likely won’t be able to smell your food? If so, then feel free to bring foods that contain a strong odor, like a chicken curry dish or a tuna fish sandwich. However, if you’re in a cubicle, or work very close to another employee, you’ll want to be mindful of food odors. Consider foods that barely smell, like a fried chicken sandwich or pasta primavera. Does your office offer you any cooking appliances? Some companies offer their employees free use of microwaves, refrigerators, and conventional ovens. If yours does, than you can bring in almost any meals. Simply stick it in the fridge so it stays fresh, and then warm it up when you’re ready to eat it. And you may even be able to prepare your meals fresh at the office. Keep lunch meat, cheese, and bread in your fridge, and make yourself a toasted sandwich. Or keep egg whites and assorted veggies in the fridge, mix together and microwave for a minute, and have yourself a tasty omelet. If you company does not offer these appliances, consider foods that are great to eat cold or at room temperature. You can bring your meals in an insulated lunch box so it stays fresh until lunch time. Examples include pasta salad or a chicken wrap. And if you’re comfortable with snacking, bring in a bag of roasted chickpeas or hummus and carrots. Once you ask yourself these three questions, you’ll be steps closer to figuring out the best office meal. Now, simply consider what foods you love to eat, and how they fit into the above guidelines. You are officially on your way to eating healthy, congrats! Author Bio: Monica LaFerla is a recent graduate of California State University, Fullerton, and currently working on the marketing team at a commercial real estate company.